James Hatcher, 41, of Titnore Way, Durrington, was fined £245 and must pay £30 victim surcharge, £85 costs, after admitting driving without due care and attention in The Street, Rustington, on May 14, 2018. His driving record was endorsed with five points. Callum McNeil, 19, of Westminster Place, Portsmouth, was discharged conditionally for 12 months and must pay £250 compensation after admitting damaging the front of an Arun District Council property in Littlehampton on May 31, 2018. Karlis Roze, 25, of York Road, Littlehampton, was fined £250 and must pay £30 victim surcharge, £85 costs, after admitting drink-driving (80mg of alcohol in 100ml of breath) in Berghestede Road, Bognor Regis, on July 11, 2018. He was disqualified from driving for 20 months. Selina Scott, 43, of Seaton Park, Wick, was given a community order and must carry out 120 hours’ unpaid work after admitting driving while disqualified in Goring Way, Goring, on June 20, 2018. She must pay £85 victim surcharge, £85 costs, and was disqualified from driving for 15 months. She also admitted driving without insurance, no separate penalty. Ashley Hearne, 24, of Tulip Tree Road, Worthing, was given a community order with Rehabilitation Activity Requirement and must pay £220.67 compensation, £85 victim surcharge, £85 costs, after admitting damaging a bathroom door in Worthing on May 20, 2018. Joanna Burtenshaw, 28, Mountview Road, Sompting, was discharged conditionally for 24 months and must pay £639.52 compensation, £20 victim surcharge, £300 costs, after admitting nine charges of fraud by dishonestly making a false representation, intending to cause loss, in Sompting on August 11, 2017; August 31, 2017; twice on October 9, 2017; October 10, 2017; December 12, 2017; twice on December 12, 2017; December 13, 2017. Baltic Express, in True Blue Precinct, Wick Street, Wick, was fined £2,000 and must pay £170 victim surcharge, £782.80 costs, after admitting supplying tobacco products, namely 62 packets of NZ Gold cigarettes, which did not carry a combined health warning, as required, in Littlehampton on September 6, 2017. Two further charges were admitted, no separate penalties, for supplying 48 packets of Marlboro Gold cigarettes, which did not carry a combined health warning, and failing to act with due care as a distributor to ensure compliance with safety requirements by possessing for supply two packets of NZ Gold cigarettes that were dangerous products. Edward Abernethy, 39, of Arundel Road, Littlehampton, was given an 11-week prison sentence, suspended for 18 months, with Alcohol Treatment Requirement and Rehabilitation Activity Requirement, after admitting assault by beating in Chichester on September 13, 2017. He must pay £250 compensation. Roy Roberts, 62, of The Steyne, Worthing, was given a community order with Rehabilitation Activity Requirement after admitting sexual assault on a male aged 16 or over, intentional sexual touching without consent in Marine Parade, Worthing. He was also given a sexual harm prevention order and must pay £250 compensation, £85 victim surcharge, £85 costs. 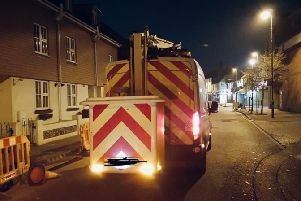 Slawomir Graczyk, 38, of Ardingly Drive, Goring, was given a community order with three-month curfew, electronically monitored, from 8pm to 5am, after admitting failing to provide a specimen for analysis when required in Berkeley Square, Worthing, on July 14, 2018. He must pay £85 victim surcharge, £85 costs, and was disqualified from driving for 24 months. Simon Lindsay, 44, of Nutley Avenue, Saltdean, was fined £420 and must pay £42 victim surcharge, £85 costs, after admitting drug-driving (8.0ug/l Delta-9-THC) in Martlets Way, Goring, on April 20, 2018. He was disqualified from driving for 18 months. Katie Tapscott, 34, of Boundary Road, Lancing, was fined £120 and must pay £30 victim surcharge, £85 costs, after admitting drug-driving (11mg cocaine) in North Road, Lancing, on March 31, 2018. She was disqualified from driving for 16 months. She also admitted drug-driving (800mg benzoylecgonine) in North Road, Lancing, on March 31, 2018; and drug-driving (6.6mg Delta-9-THC) in North Road, Lancing, on March 31, 2018, no separate penalties. Gloria Thompson, 57 of Old Shoreham Road, Shoreham, was given a community order with Rehabilitation Activity Requirement and fined £140 after admitting drink-driving (95mg of alcohol in 100ml of breath) in High Street, Shoreham, and Town Quay, Shoreham, on June 30, 2018. She must pay £85 victim surcharge, £85 costs, and was disqualified from driving for 24 months.